I cannot be the only one out there who takes leftovers and creates new masterpieces to stretch a buck, right? Take soup for example. It is the perfect means for re-purposing leftovers and is one of those dishes to be enjoyed year-round. Do you eat soup year-round? We do! 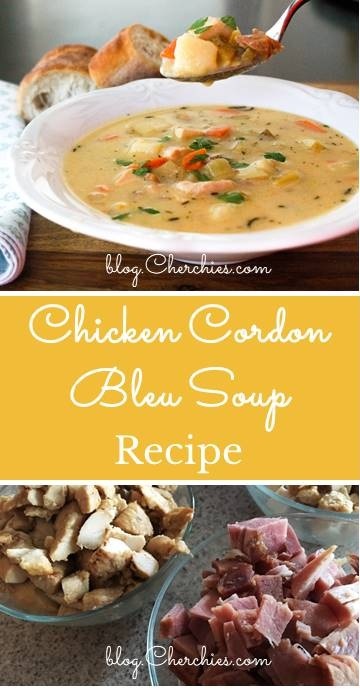 Today we have taken leftovers to a new level and combined the flavors of the classic dish Chicken Cordon Bleu (chicken, ham and Swiss cheese), added Cherchies® award-winning Champagne Mustard, and created this delicious soup your family will love. This rich, creamy soup tastes just like its iconic cousin with generous chunks of ham, chicken, Swiss Cheese, hearty vegetables, Cherchies® Champagne Mustard and Cherchies® Basil Pizzazz Seasoning. The flavors marry together beautifully to create a delicious meal your family will request over and over. What are you waiting for? Grab your leftovers and make a batch of this flavorful soup today. If there are any leftovers, portion them off into plastic freezer bags and freeze to be enjoyed year-round. Comment below and let us know how you liked this deconstructed Chicken Cordon Bleu. Thank you for visiting! Come back again! Chop onions, carrots,and celery and set aside. Wash and chop potatoes. In a Dutch oven, add enough water to cover the potatoes and cook potatoes on medium-high, until almost fork tender. Drain potatoes and set aside when they are finished cooking. While potatoes are cooking, add onions, carrots, and celery to a large skillet and cook in butter on low until tender. Add the cooked onions, carrots, and celery to the potatoes in the Dutch oven. Add the chicken broth, wine, Thyme, Rosemary, Cherchies® Basil Pizzazz, Cherchies® Champagne Mustard, chicken, and ham to the pot and simmer for 15 minutes. Add the Swiss cheese. 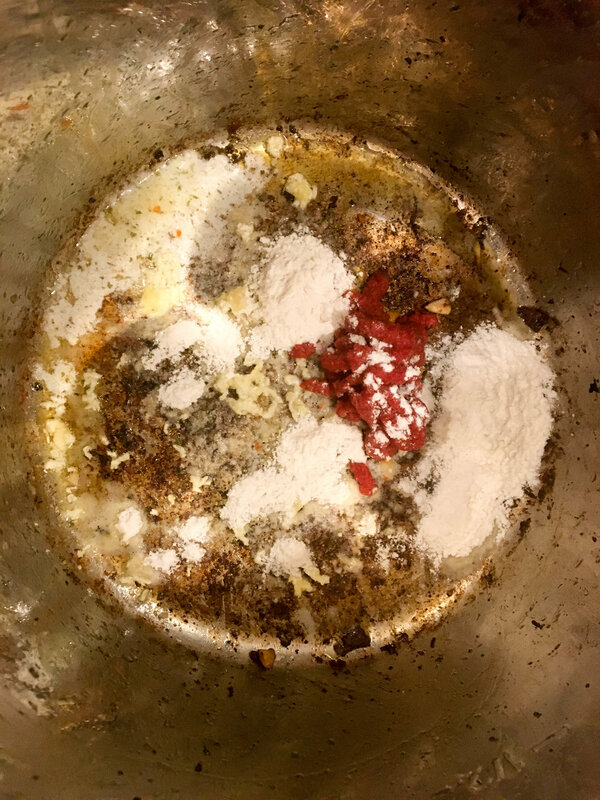 To thicken the soup, remove 1 cup of soup from pan and combine it with the flour in a food processor or blender (that can handle heat). Puree until smooth. Add the pureed soup back to the Dutch oven and stir. Add the Swiss cheese. Allow soup to cook for 5 minutes. Garnish with chopped parsley (optional). Serve with a green salad and our Best Darn Garlic Bread for a complete meal. Oooh, La La! 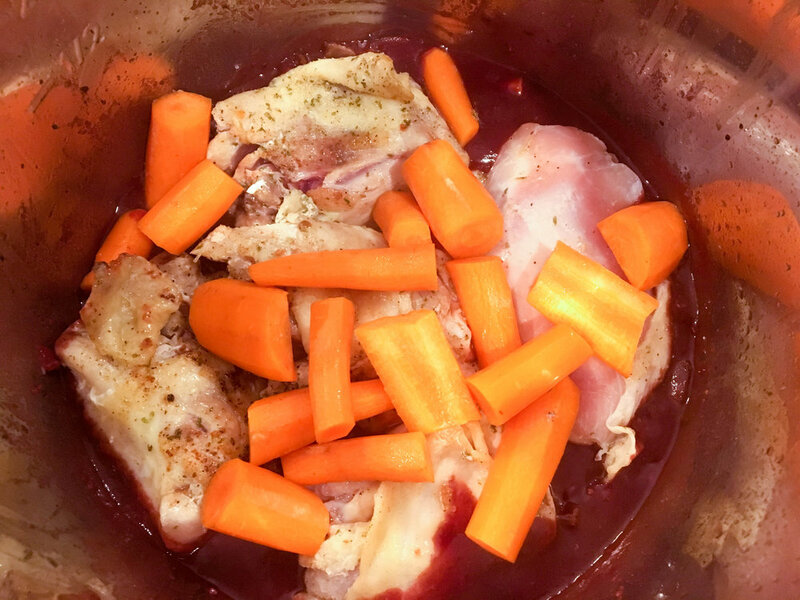 Today, I am sharing one of my favorite slow cooker “Frenchy” dishes, Coq Au Vin, which translates to chicken with wine. Every time I make this rich stew, I seriously want to lick the bowl clean it is that good. 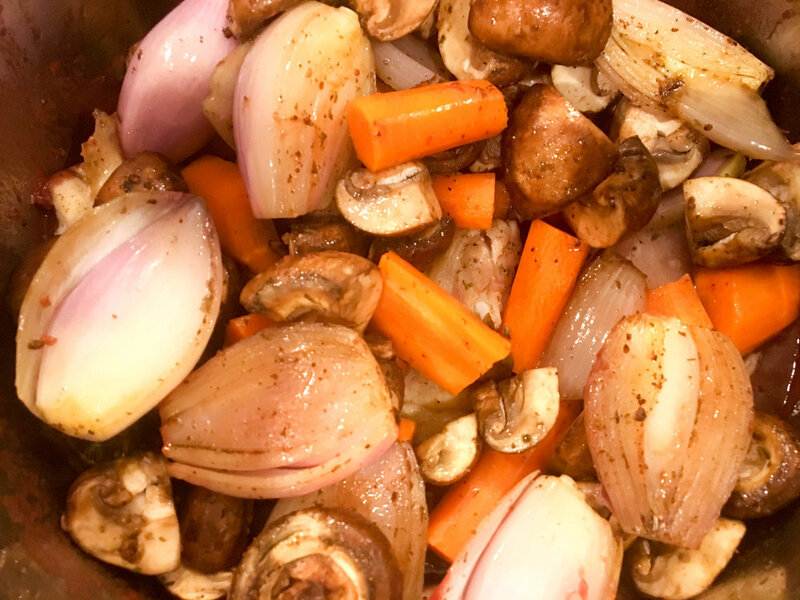 This flavorful stew with its wine-infused broth and layers of tender chicken, salty bacon, vegetables, and savory herbs, will soon become a family favorite. Although there are several steps in the beginning to this delicious meal, have no fear, it is well worth the effort, as those steps impart the intense layers of flavor, characteristic of this dish. And because this dish is slow cooked to perfection, you prepare the ingredients and walk away until dinner it is cooked hours later, which makes it an ideal meal for busy families, guests, or anytime you need a break in the kitchen. So what are you waiting on? 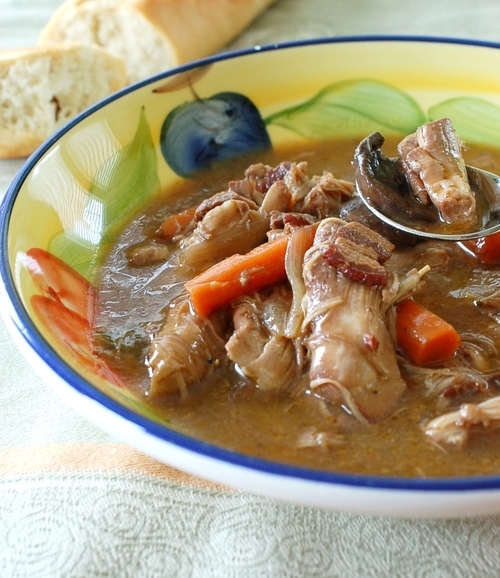 You need to make this deliciously hearty stew tonight. You will not be disappointed! Make sure to grab some crusty bread to sop up the glorious juices of this amazing dish. Comment below and let us know how you liked it! In a large saucepan over medium-high heat, boil the wine until reduced by half, about 15 minutes. Peel and chop the vegetables as directed above. Place the parsley sprigs, thyme sprigs, and bay leaf against the cut side of the halved leek and tie with kitchen twine. (The fancy word is bouquet-garni which means a bundle of herbs). (You may notice the picture is missing a leek. I asked hubby to pick one up when he came home, but he brought home fennel instead;) Set the vegetables and herbs aside. In a large skillet on medium heat, add the bacon and cook until crisp, about 10 minutes. 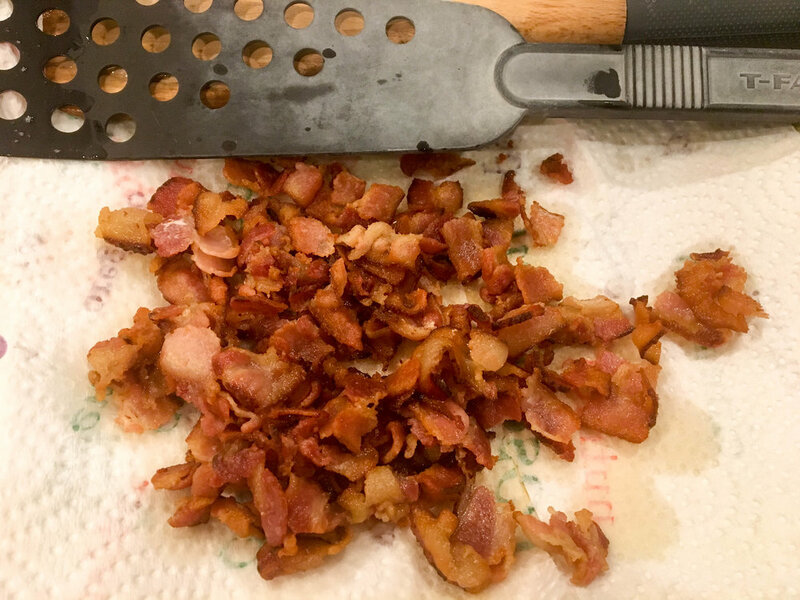 Transfer the bacon to a paper towel-lined plate to drain off the grease. Remove all but 2 (Tablespoons) Tbsp. of the grease from the pan. Season the chicken with Cherchies® Garlic Seasoning and pepper. Increase the heat to medium-high, and working in batches, brown the chicken, turning once (4 to 5 minutes on each side). Remove and transfer to a slow cooker. Top with carrot pieces. To the same skillet, add the mushrooms and cook, stirring occasionally, until they are beginning to brown, 6 to 8 minutes. Add the shallots and cook, stirring, for 2 minutes. Remove vegetables from pan and transfer to slow cooker. Spoon over chicken. Again, using the same skillet, melt the butter in the skillet. 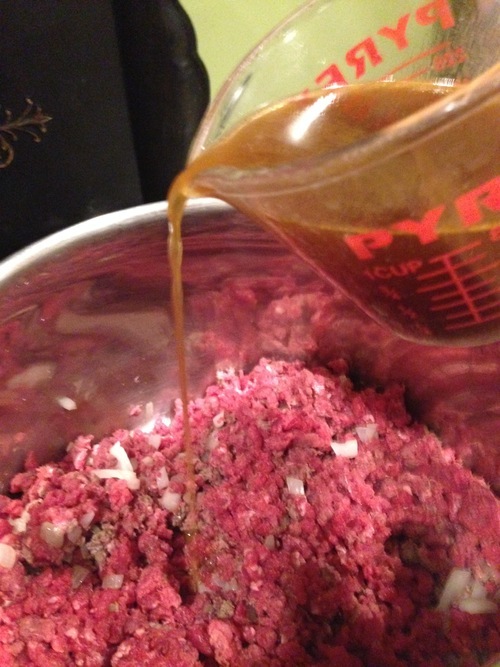 Add the garlic, tomato paste, Cherchies®Champagne Mustard and flour, and cook, stirring constantly, for 1 minute. Whisk in the reduced wine and the chicken broth and bring to a simmer. 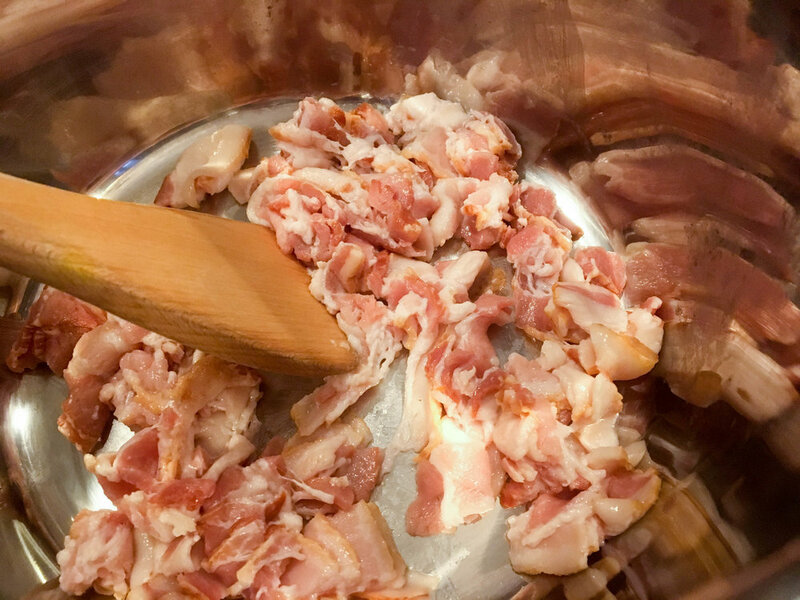 Add the bacon, and bouquet garni to the slow-cooker. Set the cooker on the high setting, cover and cook until the chicken is fork-tender, about 4-5 hours. 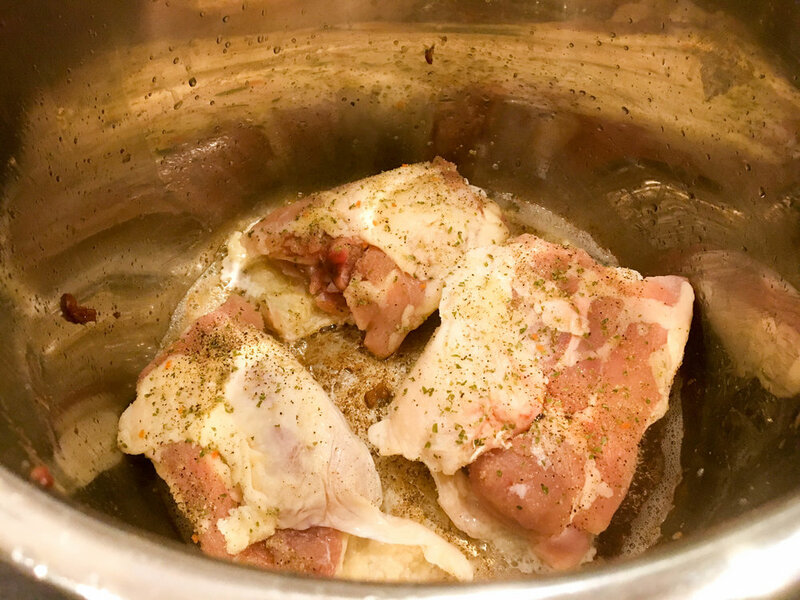 When the chicken is tender, discard the bouquet garni and adjust the seasonings with salt and pepper. Garnish with the chopped parsley and serve immediately. Serves 4 to 6. Serve with crusty bread to sop up the juices and Cherry Apple Tart Recipe for a complete meal. Happy Summer everyone! For those who grow vegetables in the Summer, your tomatoes may be about ready for harvest! If so, why not make the best of Summer's bounty with this easy, flavorful cod recipe, bursting with juicy, ripe tomatoes, fresh basil, and smothered in a delicate, lemony basil sauce. Delicious! Summer calls for lazier days and easier menus with fresh, flavorful ingredients. This recipe (adapted from bakerbynature.com) featuring Cherchies® Garlic Seasoning and Cherchies® Basil Pizzazz, is a recipe we're sure your entire family will love. It is also perfect for summer entertaining! Share a photo of your finished product on Instagram or Facebook, and let us know your thoughts below! Thank you for stopping by! In a large pan, heat oil over medium heat. Add the crushed red pepper flakes and garlic and saute for 1 minute. Add the halved cherry tomatoes and cook, stirring occasionally, for about 9 to 12 minutes. Tomatoes should be soft, but still should retain their shape. Add in the white wine, stir, and allow the mixture to come to a simmer. Stir in Cherchies® Basil Pizzazz, lemon juice, lemon zest, and butter, and cook for 2 minutes. Transfer the sauce and tomatoes into a bowl and set aside temporarily. Using the same pan, heat the oil over medium heat. Season both sides of cod with Cherchies® Garlic Seasoning and pepper. Place cod in the oil and cook until golden brown, about 5 minutes. Carefully turn the cod over and continue cooking for another 5 minutes, or until it's cooked through. Add in the tomatoes and the sauce to the pan and heat for a minute with the cod. Serve the cod immediately and pour the sauce over the fish. Garnish with chopped basil and lemon wedges for a beautiful presentation. Serve this recipe with our Strawberry Spinach Salad and sop up the sauce with The Best Darn Garlic Bread Recipe. Raise your hand if Mexican food is one of your favorite ethnic dishes! How about Italian food?! I was torn last week on what to make for dinner, so I combined our family's two favorites (Italian and Mexican) and created these mouth-watering, Mexican-inspired stuffed shells. As you know, traditional stuffed shells are filled with Italian cheeses and meat, and are lovingly bathed in a savory marinara sauce. For this zestier version, we stuffed taco meat (seasoned with Cherchies® Select Grilling Rub & Seasoning Blend), black beans, Cherchies® Pretty Hot Peppers, and cheese into jumbo pasta shells, and steeped them in salsa for a meal bursting with Mexican flavors. Add a twist to Taco Tuesday by creating this easy, Mexican dish full of zippy flavor, and serve a meal your family is going to love! You may want to make a second batch to freeze for later! Comment below to let us know how you liked the recipe. Jumbo Pasta Shells (enough to fit in 8x 11 baking dish), cooked according to package directions, 5 minutes under cooking time. In a large skillet, sauté onion in olive oil on medium-low heat until translucent. After onion has cooked, add ground meat, Cherchies® Select Grilling Rub & Seasoning Blend, and beef base or bouillon mixed in water. Turn heat to low and simmer meat until no longer pink. While meat is cooking, cook pasta according to package directions minus 6 minutes, and drain and set aside. (Shells are easier to fill when they are al dente, plus they won't get mushy when cooked in the oven). 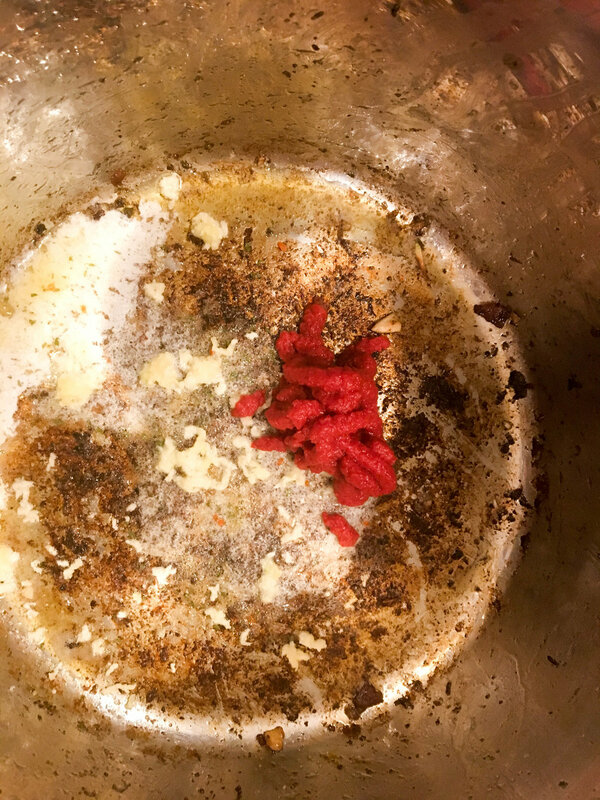 As meat finishes cooking, add Cherchies® Pretty Hot Peppers, 1 cup of salsa/pico de gayo, and the can of black beans to the mixture, stir, and cook for a few more minutes. Next, add 1/2 cup shredded cheese to the meat mixture and stir until melted. Turn off heat and allow the meat to cool for ten minutes. (This will make filling the shells easier). To a 9x13 baking dish, add the other cup of salsa/pica de gayo, and spread evenly in the pan. After meat and shells have cooled slightly, hold individual shells in hand and fill shells with meat mixture and carefully place in baking dish. Drizzle Taco sauce over shells, then sprinkle remaining 1 cup of cheese over shells. Bake in the oven for 15-20 minutes, or until bubbly and cheese is melted. Garnish with chopped green onions and olives (optional) and serve!